Green building industry will grow by 20 per cent in India in the next three years, mainly on account of environmental regulation and rising demand. According to reports from the USGBC, by 2018, the green building industry in India will grow by 20 per cent driven largely by environmental regulations and demand for healthier neighborhoods. Green buildings are being considered as the modern day architectural marvels because of their potential to protect environment and transforming real estate market substantially. After having successfully hosted 7 annuals in the past, Nispana announces the 8th Annual “Sustainability in Design & Construction India” (SICI) 2017 scheduled on the 17 & 18 August 2017 at the Vivanta by Taj, M.G. Road, Bengaluru. GBCI feature as Green building partners while Association of Consulting Civil Engineers India (ACCE) feature as Association Partners. This year’s edition will feature an array of presentations and interactive panel sessions from national & international experts to address current challenges faced and ensure that there is a robust system certifying green credentials as well as active participation by the government, builders and citizens in order to build structures that are both eco-friendly and responsive to citizen needs. 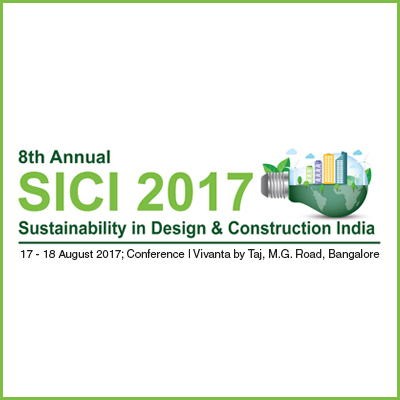 The conference will feature prominent and visionary green building experts like Mr. Sanjay Seth – TERI; Ashok B. Lall – Ashok B Lall & Associates; Saurabh Diddi – BEE, India; Milli Majumdar – GBCI; Tan Szue Hann – Singapore Institute of Architects; Anand Mahendr – Bechtel Corporation, India; Monica Nair – WS Atkins India; Henriette Faergemann – EU Delegation to India and many more. KNAUF & FARO feature as Networking solution providers. The official media partners are “Construction World” in addition to a host of prominent media partners. Nispana has offices in India, UAE and USA.